This article is about the American actor and stand-up comedian. For the mayor of New York 1926–1932, see Jimmy Walker. For other persons named Jimmy Walker, see Jimmy Walker (disambiguation). James Carter Walker Jr. (born June 25, 1947) is an American actor and comedian. Walker is best known for portraying James Evans Jr. ("J.J."), the oldest son of Florida and James Evans Sr. on the CBS television series Good Times, which ran from 1974 to 1979. Walker was nominated for Golden Globe awards Best Supporting Actor In A Television Series in 1975 and 1976 for his role. While on the show, Walker's character was known for the catchphrase "Dy-no-mite!" which he also used in his mid–1970s TV commercial for a Panasonic line of cassette and 8-track tape players. He also starred in Let's Do It Again with John Amos, and The Greatest Thing That Almost Happened with James Earl Jones. Walker continues to tour the country with his stand-up comedy routine. Walker was born in The Bronx, New York. Walker attended Theodore Roosevelt High School in New York City. Through a federal program known as SEEK, or "Search for Education, Evaluation, and Knowledge," he continued his studies and entered into the field of radio engineering with WRVR. As a young man, Walker was a vendor at Yankee Stadium, starting with the 1964 World Series. He was given a silver dollar by Mickey Mantle, which he still has. In 1967, Walker began working full-time with WRVR, the radio station of the Riverside Church. In 1969, Walker began performing as a stand-up comedian and was eventually discovered by the casting director for Good Times, after making appearances on Rowan & Martin's Laugh In and on the Jack Paar Show. He eventually released one stand-up comedy album during the height of his Good Times popularity: Dyn-o-mite on Buddah Records (5635). During Good Times' 1974–75 season, Walker was 26 years old, though his character was much younger. John Amos, the actor who portrayed Walker's father on Good Times, was actually just eight years older than Walker. Walker credits producer/director John Rich for inventing "Dy-no-mite!" which Rich insisted Walker say on every episode. Both Walker and executive producer Norman Lear were skeptical of the idea, but the phrase and Walker's character caught on with the audience. Also, off- and on-camera, Walker did not get along with series' lead, Esther Rolle, who played Florida Evans, in the series, because she and Amos disapproved of Walker's increasingly buffoonish character and his popularity, and Walker felt hurt by their disdain. Dissatisfaction led Amos (before Rolle), to leave the show, making Walker the star of the show. Walker was the only Good Times star to not attend Rolle's funeral. During 1975 Walker was also a weekend personality on contemporary R&B music station KAGB 103.9 FM licensed to Inglewood in the Los Angeles market. Walker appeared on The Tonight Show and Match Game during the 1970s and early 1980s. He also appeared on the 1990 revival of Match Game and various game shows during that era. Walker has made guest appearances on Badge 373, The Love Boat, Fantasy Island, The Larry Sanders Show, Son of the Beach, The Drew Carey Show, The John Larroquette Show, In the House, Cagney & Lacey, The Fall Guy, Scrubs, Star Dates, Everybody Hates Chris, George Lopez, Chelsea Lately and Lincoln Heights. He also appeared in films such as Rabbit Test (1978), The Concorde ... Airport '79 (1979), Airplane! (1980), Water (1985), Doin' Time (1985), The Guyver (1991), Monster Mash (1995) and Plump Fiction (1997). Aside from guest appearances, he starred in the short-lived television series At Ease in 1983 and Bustin' Loose in 1987. In the 1990s, Walker returned to his radio roots hosting shows on WHIO, WOAI, WLS, and KKAR. In 1996, he appeared on split release with Powerviolence band Spazz distributed by Spazz owned label Slap-a-ham records. In 2010, Walker made a cameo appearance in the movie Big Money Rustlas. In 2011, Walker appeared in a Syfy channel movie Super Shark. 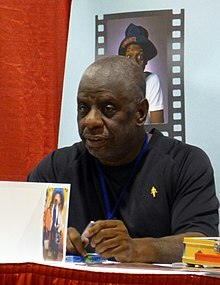 In 2012, Jimmie Walker's autobiography Dyn-o-mite! Good Times, Bad Times, Our Times – A Memoir, was published. In 2012, Walker announced the release of his official app developed by Monty Goulet for iOS. According to an appearance on The Wendy Williams Show on June 27, 2012, Walker stated he has never been married nor fathered children, but has had many girlfriends. Walker appeared on The O'Reilly Factor on July 11, 2012. He stated that he did not vote for Barack Obama and that he would not vote for him in the 2012 election either. In an interview with CNN, Walker described himself politically as a "realist independent" and stated that he opposed affirmative action, saying that it had outlived its usefulness. He also said that he was against gay marriage on moral grounds, but believed its legalization should be passed, stating it was not worth fighting against. Walker described his political beliefs at length in his autobiography, Dyn-O-Mite: Good Times, Bad Times, Our Times: A Memoir. In it, he called himself a "logicist," who believes in "logic and common sense", holding conservative positions on many issues. Despite rumors that Walker was dating conservative pundit and author Ann Coulter, they are just close friends. On August 3, 2017, Walker publicly announced his support for President Donald Trump, saying that he was "for probably 90 percent of the things he does." 1975 Let's Do It Again Bootney Farnsworth Action/crime film directed by Sidney Poitier. 1978 Rabbit Test Umbuto Comedy film directed and written by Joan Rivers. 1979 The Concorde ... Airport '79 Boisie Air disaster film directed by David Lowell Rich. 1980 Airplane! Windshield Wiper Man Parody film directed and written by David Zucker, Jim Abrahams, and Jerry Zucker. 1991 The Guyver M.C. Striker Science fiction film directed by Screaming Mad George and co-directed by Steve Wang. 2010 Big Money Rustlas Townsperson Parody film written by Joe Bruce and Paul Andresen, and directed by Andresen. Follow up film of, Big Money Hustlas. 2011 Super Shark Dynamite Stevens Sci-fi Horror film written by Fred Olen Ray, and directed by Fred Olen Ray. The Greatest Thing That Almost Happened Morris Bird III Made-for-TV-Movie directed by Gilbert Moses. Murder Can Hurt You Parks the Pusher Made-for-TV-Movie directed by Roger Duchowny. 1996 Space Ghost Coast to Coast Himself Episode: "Surprise"
2006 Minoriteam Fasto's Grandfather Episode: "Balactus: Part II"
^ "Jimmie JJ Walker's Gigs". Archived from the original on 2008-08-17. Retrieved 2008-08-18. ^ a b "Jimmie 'J.J.' Walker lights 'Dy-no-mite' on gay marriage, Leno and dating". CNN. July 16, 2012. Retrieved February 12, 2012. ^ "Was Jimmie Walker getting along with Esther Rolle and John Amos on the set? [Archive] - Sitcoms Online Message Boards - Forums". www.sitcomsonline.com. Retrieved 30 July 2018. ^ Company, Johnson Publishing (2 November 1987). "Jet". Johnson Publishing Company. Retrieved 30 July 2018 – via Google Books. ^ "Jimmie 'J.J.' Walker enters No Spin Zone". Fox News. July 11, 2012. Archived from the original on September 6, 2012. Retrieved February 12, 2013. O'REILLY: Did you vote for him first time around? / WALKER: I never voted for him. ^ Walker, Jimmie (June 26, 2012). Dyn-O-Mite: Good Times, Bad Times, Our Times: A Memoir. Boston: Da Capo Press. pp. 194–203. ISBN 0-306-82083-8. ^ "Ann Coulter Breaks Her Silence On Jimmie Walker Romance Rumors". 5 April 2017. Retrieved 30 July 2018. ^ "Norman Lear Says Jimmie Walker Dates Ann Coulter". Retrieved 30 July 2018. ^ Glines, Caroline (August 3, 2017). "'Good Times' star Jimmie Walker supports Trump, slams PC culture". www.foxnews.com. Fox News. Retrieved August 3, 2017. ^ Parker, Ryan (August 3, 2017). "'Good Times' Star Jimmie Walker Supports Trump, Defends Bill Maher". www.hollywoodreporter.com. Hollywood Reporter. Retrieved August 3, 2017. ^ "Let's Do It Again". Turner Classic Movies. Retrieved May 21, 2016. ^ "Rabbit Test". Turner Classic Movies. Retrieved May 21, 2016. ^ "The Concorde ... Airport '79". Turner Classic Movies. Retrieved May 21, 2016. ^ "Airplane!". Turner Classic Movies. Retrieved May 21, 2016. ^ "The Greatest Thing That Almost Happened". Turner Classic Movies. Retrieved May 21, 2016. ^ "Murder Can Hurt You". Turner Classic Movies. Retrieved May 21, 2016.